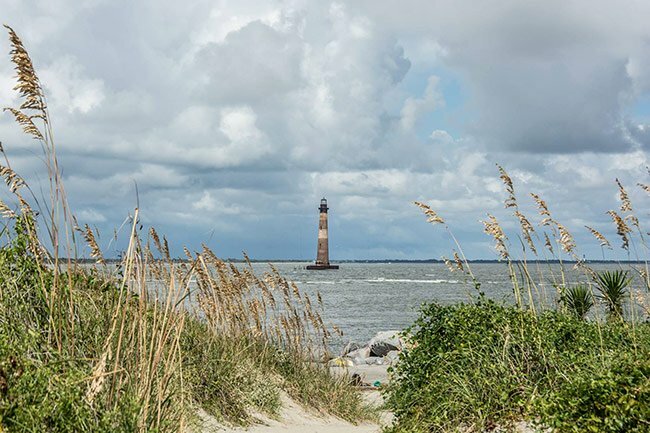 The Morris Island Lighthouse, located just off the northern coast of Folly Beach, proudly guards the Charleston Harbor. 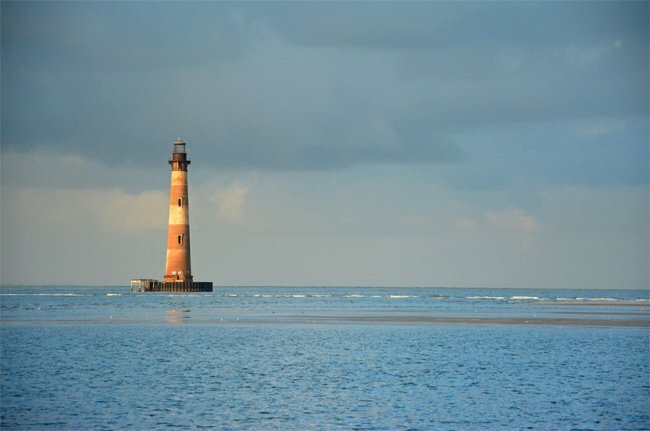 When it was built in 1876, the lighthouse stood almost a mile inland – it now stands amidst the Atlantic Ocean, listing slightly to one side, as seen below. 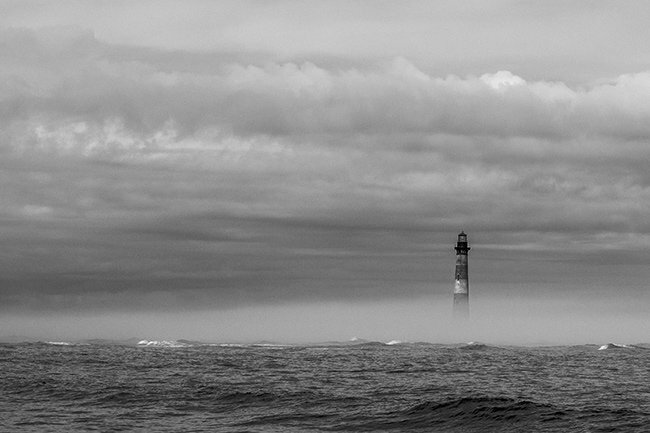 Many people love the lighthouse and have worked hard over the years to protect it. 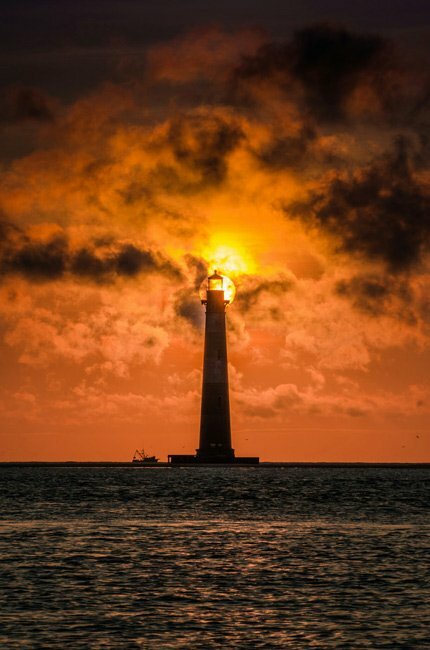 Save the Light, a local grassroots organization, raised money to buy the lighthouse from its former owner in 1999. 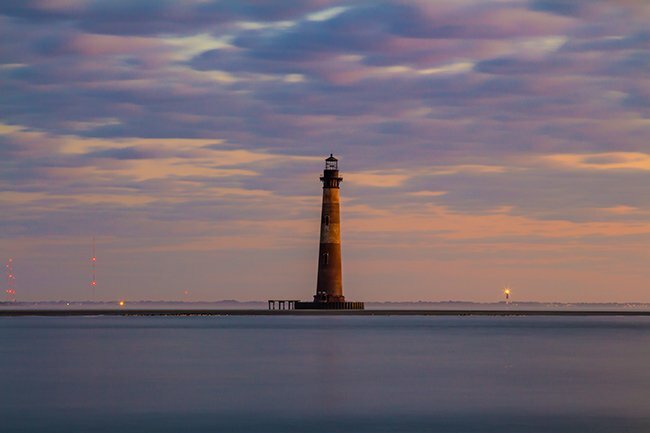 The Morris Island Lighthouse is now owned by the state of South Carolina, but Save the Light continues to lead the way in its restoration and preservation. Restoration efforts thus far have been threefold. 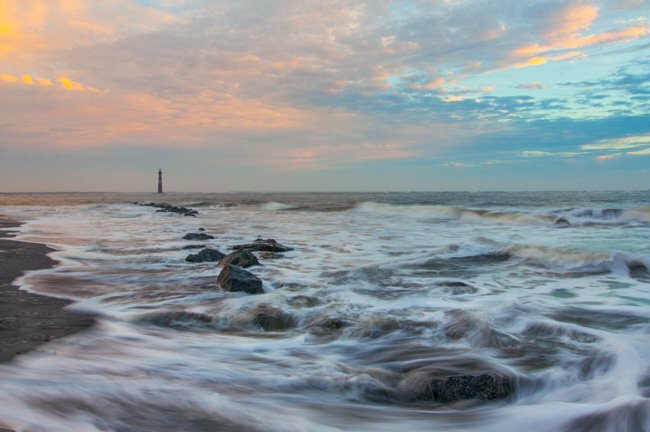 First, the US Army Corps of Engineers built a steel cofferdam (enclosure) around the lighthouse’s base. Second, large stones were placed in a circle surrounding the cofferdam to prevent further erosion. Finally, in 2010, new pilings were installed to stabilize the foundation. The images above and below detail these efforts. 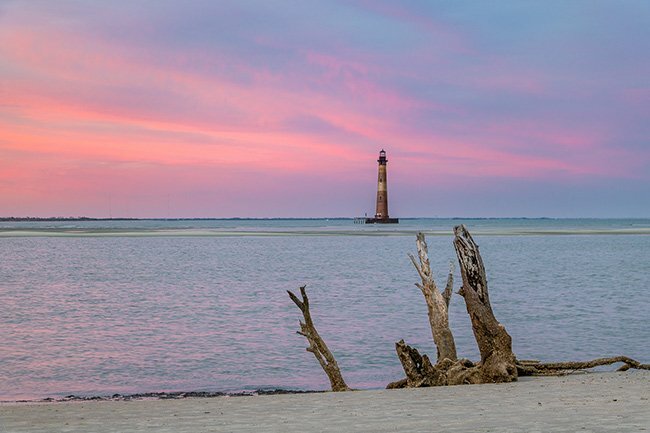 Morris Island itself is accessible only by boat, but the lighthouse is visible from many of Charleston’s coastal communities. Today a tiny and fragile island, Morris Island was once home to at least 15 buildings, including three Italianate cottages, a small schoolhouse, and numerous barns and other outbuildings. The small village was connected to the back of the island by a long, wooden walkway. 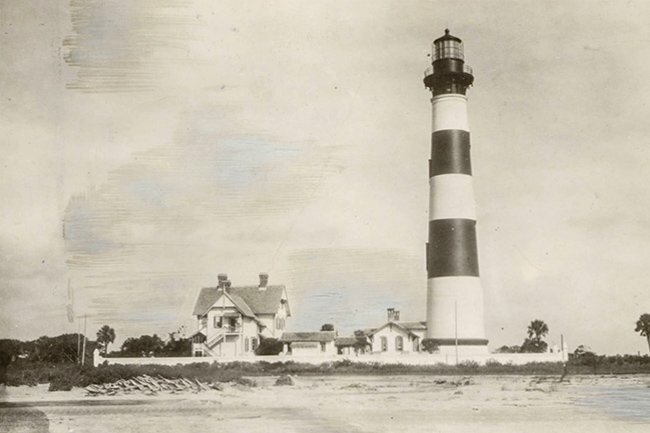 Many lighthouse keepers and their families lived there over the years. 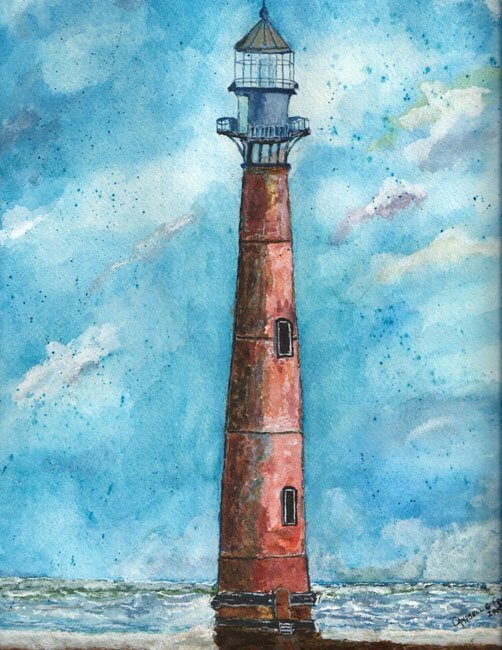 The first lighthouse on the island stood just 42 feet tall and was erected in 1762. Its 1838 replacement stood 60 feet taller and featured a revolving light. During the Civil War, the Confederate army destroyed the structure to prevent Union troops from using it as a lookout tower. The US government replaced it immediately after the war. 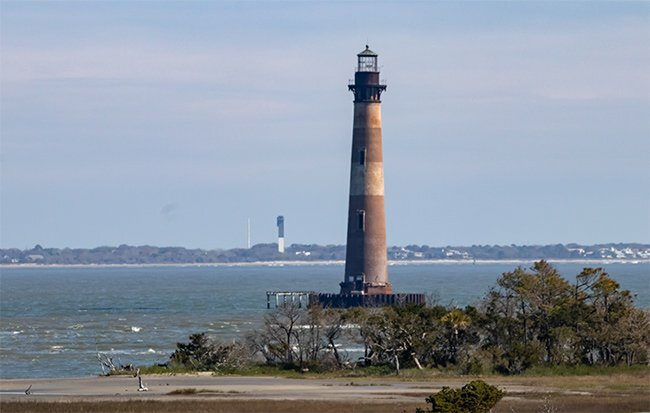 This new Morris Island Lighthouse operated continually from 1876 until 1962, when it was decommissioned and replaced by a modern lighthouse on Sullivan’s Island. 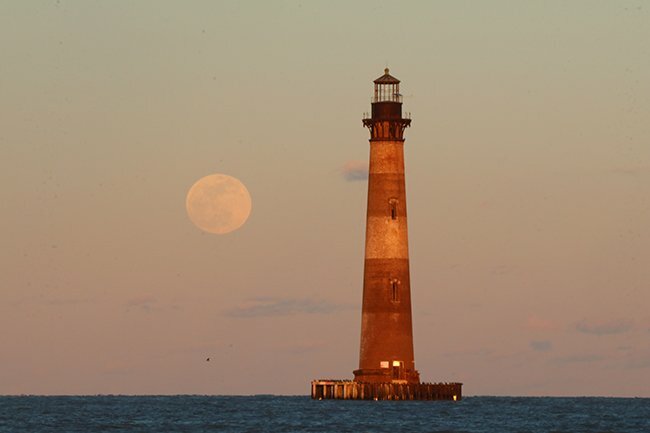 On October 1, 2016 the Morris Island Lighthouse shone once again. The lighthouse was lit as part of a fundraising event celebrating the guidepost’s 140-year anniversary. 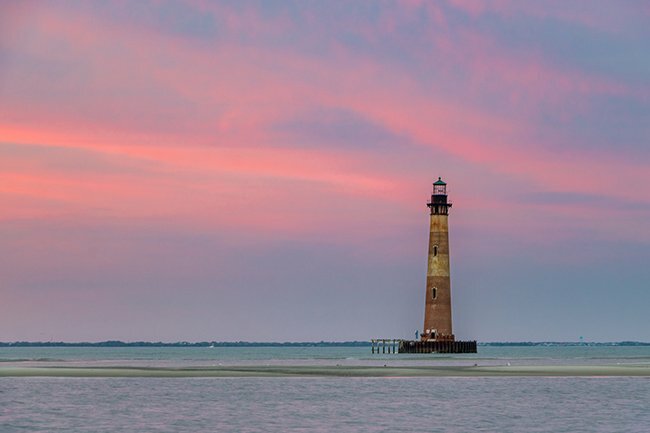 The private preservation group Save the Light collaborated with South Carolina Electric and Gas to create a beacon duplicating the pattern of light that at one time flashed regularly from the structure’s cupola. 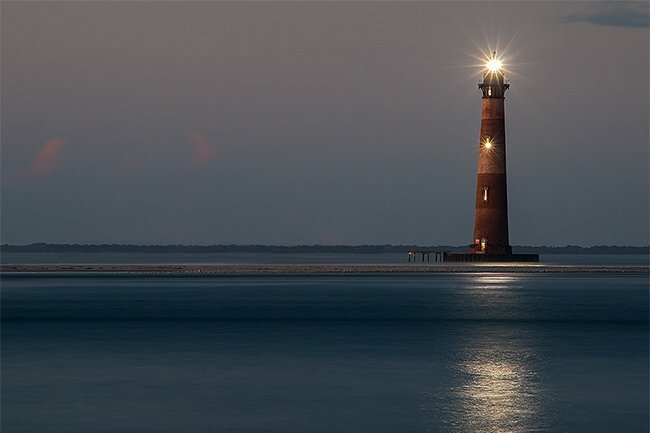 With modern technology, including LED lights, modems, a cellphone tower, and solar-powered batteries, engineers were able to shine the light for a spectacular show, illuminating the sands of Folly Beach to the delight of onlookers on both the beach and in boats. The light was directed toward the beach so as not to interfere with navigation. 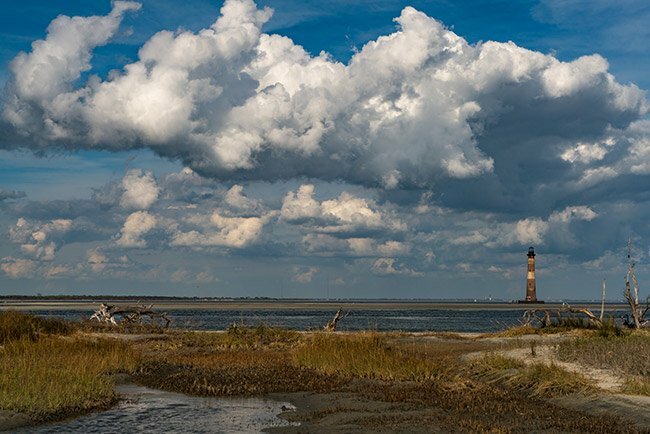 Morris Island light is fabulous to view. 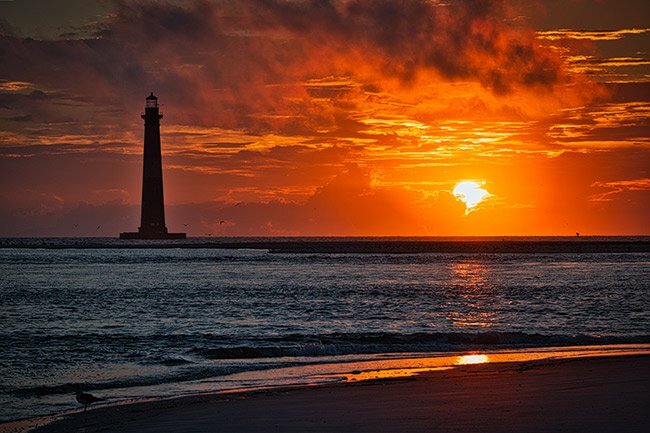 I live in Greer, SC and when I go to the beach at Isle of Palms I can see the light. Have had a picture of it for years. Also good view from Fort Moultrie. Wish I could climb it but not. 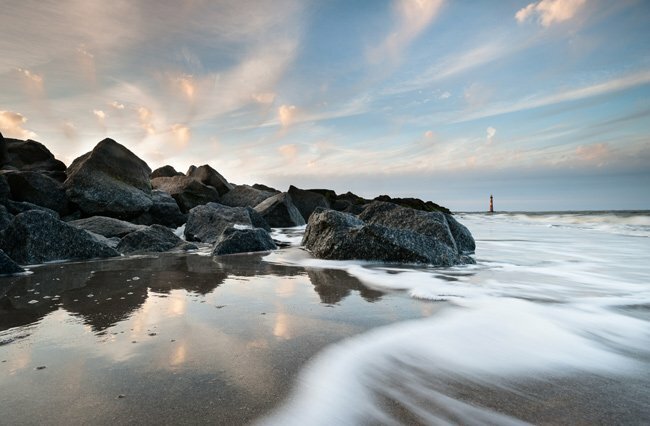 Have been in Cape Hatteras a few time, Ponce Islet, and Carrituck. Wish I could see Morris Island from Pretty Place at the Greenville YMCA camp on Caesars Head. I may live in Greer but have lighthouse and beach decorations. Remember that BEACH is the acronym for Best Escape Anyone Can Have. 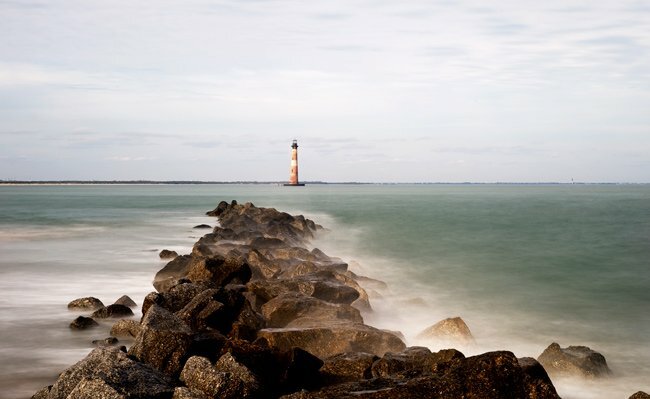 Love the PICS OF THE Morris Island lighthouse! Shared to raise awareness. Thanks! 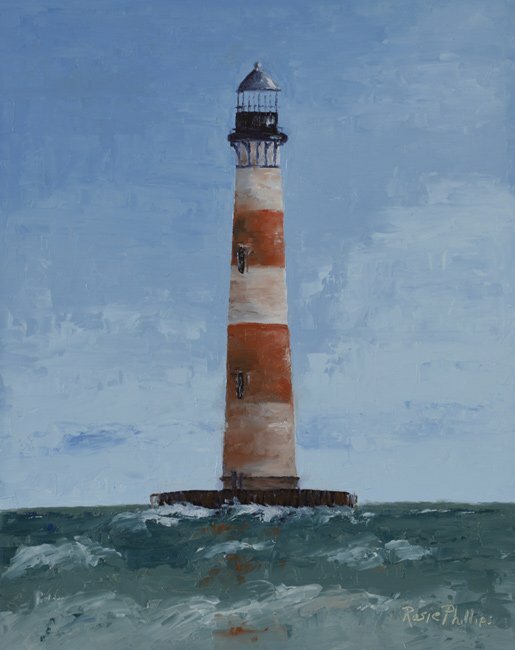 I am re painting a ceramic lighthouse that shaped and looks just like the Morris Island Ligthouse. it is so far away I can not see details good. The one I have has the U shape door but no windows. I wanted to get as close to the real thing as I could. I am asking permission to paint mine as close to your copy? 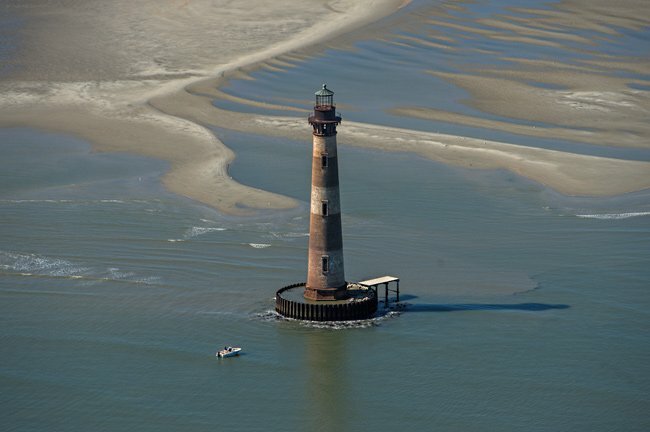 The Morris Island Lighthouse is owned by the Stat of South Carolina but cared for by Save The Light Inc. a non profit citizens group formed in 1999. Since out formation, we have raised and spent almost 5 million dollars in protecting the structure from erosion and placing a new foundation under it. We are actively raising money to rehab the lantern room as our next step in the tower's preservation. I hope that all of you will visit our web site at SAVETHELIGHT.ORG to become a member. We are holding out major fundraiser on the 26th of March at Folly Beach. Please contact us for tickets or to make a donation. 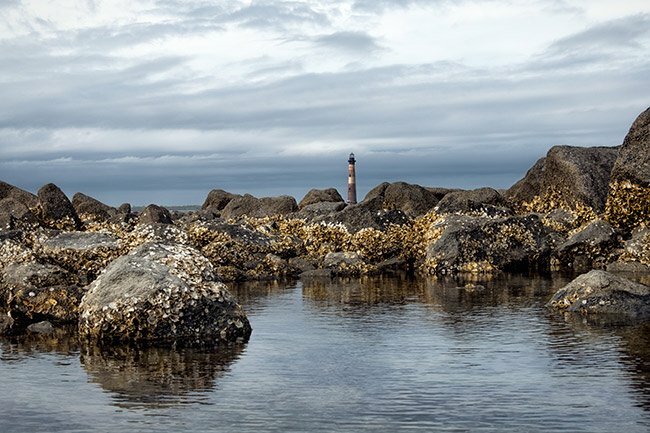 Did the lighthouse ever have a rock walkway leading to it from shore? 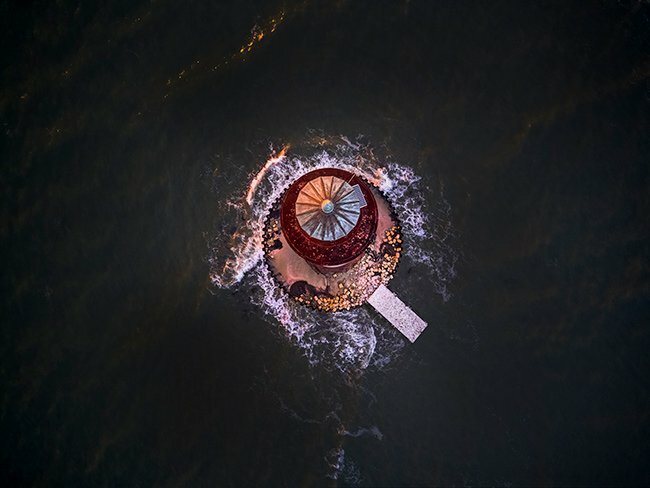 I remember seeing a lighthouse as a child with a walkway surrounded by water leading to a lighthouse that could have been this one. My parents sort of remember the same, but don’t remember where. I have been searching for it for the last 30 years. It would have to have been on the Atlantic coast in the mid-1950s. 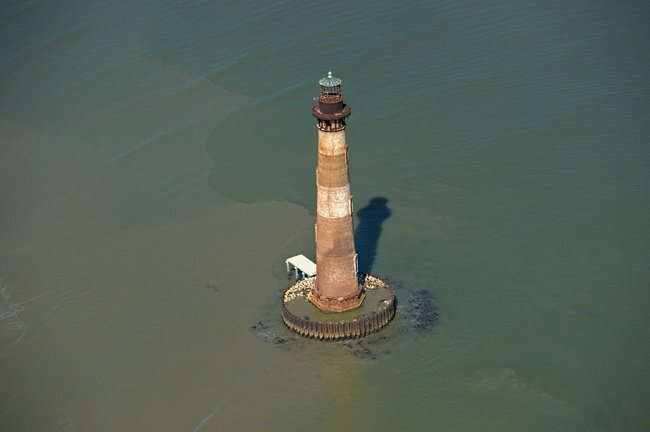 Great pictures of Morris Island lighthouse. Looks good all the way from Tigerville, SC. Upper Greenville County’s Tigerville. Gorgeous photos. I miss my SC beaches, so this is a nice way to be reminded. I like James P. Karner’s A LOT. Cool job all.